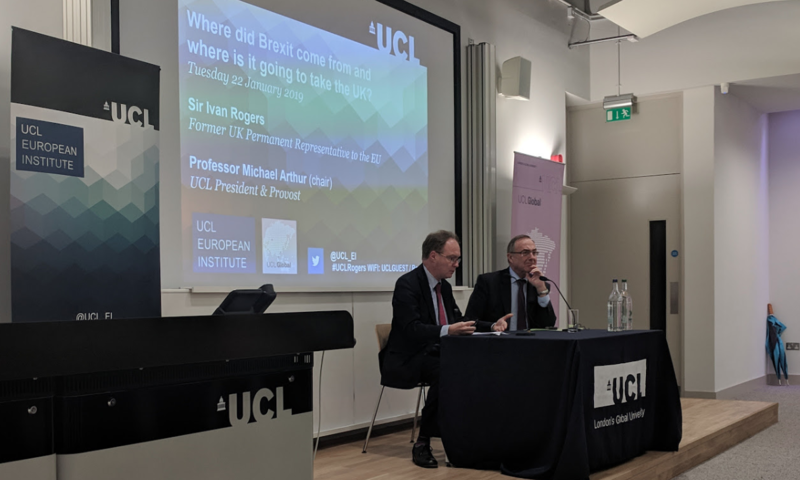 On 22 January 2019, Sir Ivan Rogers delivered a showpiece public lecture for the UCL European Institute. The lecture was chaired by UCL President & Provost Professor Michael Arthur, and kindly supported by the UCL Global Engagement Office. We are pleased to announce that the full text of the lecture, as well as the full video recording, are available online. Sir Ivan Rogers (KCMG) is a former senior British civil servant who was the UK's Permanent Representative to the European Union from November 2013 to January 2017. Prior to holding this position, he served as Prime Minister’s adviser for Europe and Global Issues (2012-2013) to PM David Cameron and as Principal Private Secretary to the Prime Minister (2003-2006) for PM Tony Blair. He is singularly well placed to comment on the causes and consequences of Brexit. Event page: Sir Ivan Rogers: Where did Brexit come from and where is it going to take the UK?